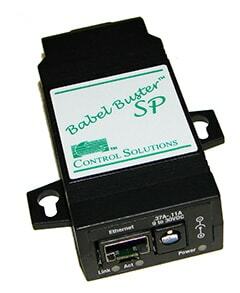 The Babel Buster SP-GW is a Modbus RS-232 bridge that transparently connects a Modbus RTU RS-232 device to Modbus TCP and vice versa. All requests received from an RS-232 master are passed straight through to Ethernet servers. When configured to go the other way, all requests received from an Ethernet client are passed straight through to the RS-232 slave. 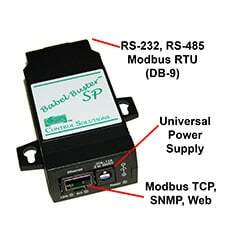 The SP-GW Modbus bridge can be configured to connect a single RS-232 device, or multiple Modbus RTU RS-485 devices, to a single IP address on the TCP network. 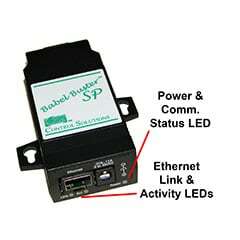 Conversely, the SP-GW Modbus bridge can be configured to connect multiple Modbus TCP devices to a Modbus RTU RS-232 port. 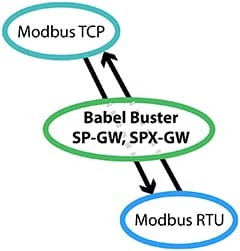 Babel Buster SP-GW is a transparent gateway for mapping Modbus RTU devices to Modbus TCP and vice versa. All requests received from an RS-485 Modbus RTU master are passed straight through to Modbus TCP servers. 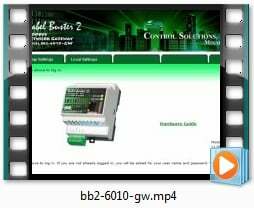 When configured to go the other way, all requests received from a Modbus TCP client are passed straight through to RS-485 Modbus RTU slaves. The SP-GW is non-mapping in terms of mapping registers. The SP-GW does not have any internal registers. It strictly maps RTU slave addresses to IP addresses. The SP-GW includes its own internal web server that provides a web based user interface for configuring the SP-GW. Configuration is done using simple templates, and each web page has an online help section at the bottom. Click on the link below to view a demo copy of the entire Web UI in the SP-GW.